← Beatrice Parsons : Queen of the blazing border…. I suppose I’m not surprised. 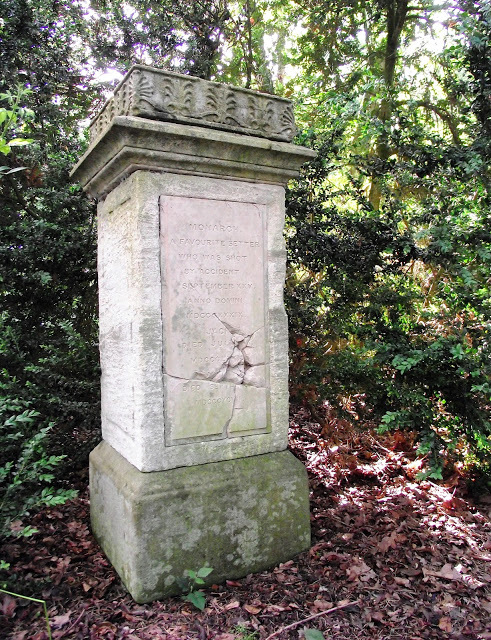 Already this year I’ve mentioned the tomb of Mrs Soane’s dog Fanny, in the courtyard of the Soane Museum, and more recently the dog’s cemetery at Wrest Park, but I’ve been amazed how many other monuments and tombstones for dogs exist in our historic parks and gardens. We’ve certainly come a long way from the days when dead dogs were thrown out with the rubbish onto the wasteland outside the town’s walls – the Houndsditch. 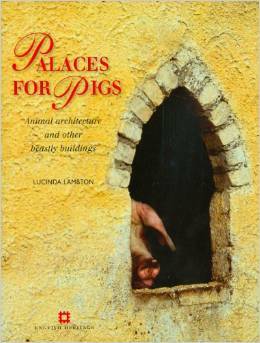 Some might think we’ve come too far in our animal commemoration of course, but as Lucinda Lambton has shown with her wonderful books on animal-related architecture, remembering and honouring our pets is part of a great British tradition and it’s still alive and well although its heyday seems to have been in the late 18th c and into the 19th. 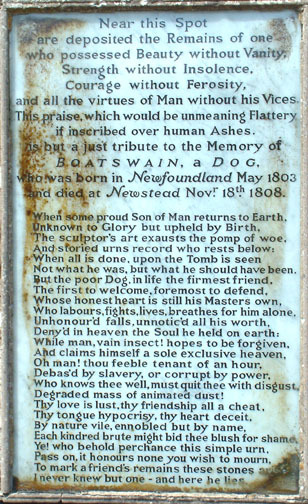 “Boatswain is dead!” wrote Byron to a friend on 18th November 2014, ” he expired in a state of madness …after suffering much, yet retaining all the gentleness of his nature to the last, never attempting to do the least injury to anyone near him.” Although mired in debt Byron commissioned an expensive marble monument for his dog, which was the only building work he initiated at Newstead , and he placed it in the centre of the Abbey ruins near to where the site of the altar. 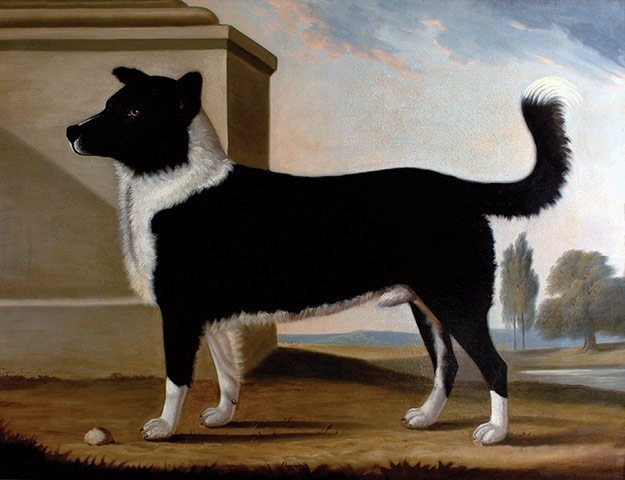 Having sold Newstead in 1817 before leaving for Greece his own request to be buried there alongside the dog was later refused by the new owners. 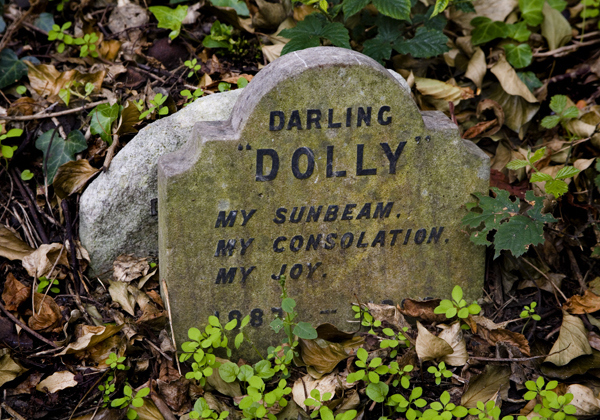 A dog cemetery [or sometimes a more all-encompassing pet cemetery] is, of course the more usual kind of arrangement for the interment of household critters. They exist the length and breadth of the country. 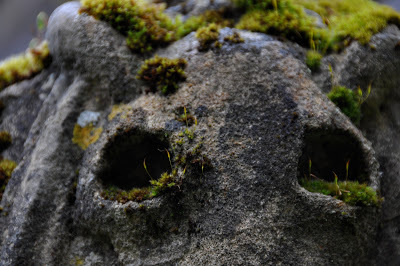 At Brahan Castle near Dingwall, Lord Seaforth who died in 1923, and his wife who died in 1933 are buried in the same space as 21 of their dogs – inside an ancient earthwork that has been converted into a kirkyard, although now overgrown with rhododendrons. One has the inscription “Cruiser, for 15 years faithful friend and companion of Col Stewart Mackenzie of Seaforth. He accompanied the 9th Lancers throughout the Afghan Campaign, 1878 – 79 – 80 including the march from Kabul to Kandahar.b 1878 d. 1895“. At sternly Italianate Brodsworth Hall, the roll call of dogs names goes from Victorian era Coup, Dash, Snap and Nell, through Tatters, Cuddie, Butty, Charley and Pippey, to Max and Wanda and Bobby. 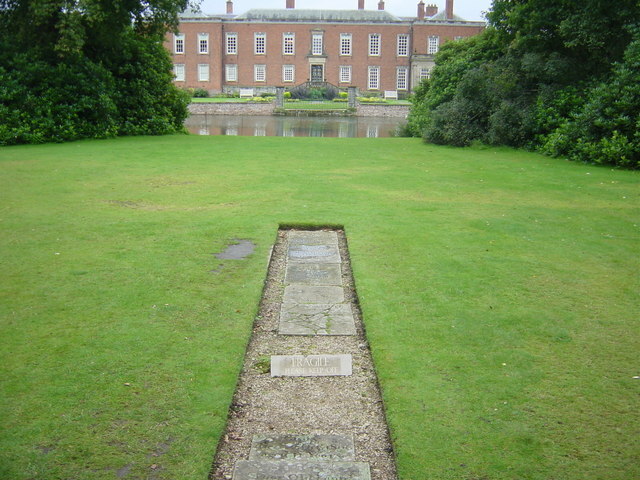 All lie near Polly Parrot, and the last dog to be buried there, Binkoe who belonged to the last owner before English Heritage took over and restored the house and gardens in the 1990s. 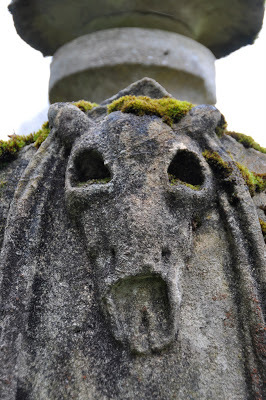 A more recent cemetery was established at Portmeirion by one of the more eccentric tenants, Mrs Adelaide Haig, who lived in the mansion from 1870 until her death in 1917. She preferred the company of dogs to human beings and kept her mongrel pack in the elegant Mirror Room where she would read sermons to them from behind a screen. The whole place became a wilderness, as she would not allow the destruction of any growing thing. When she died the hearse that came for her could not reach the house until woodsmen had hacked a way along the jungle-choked drive. 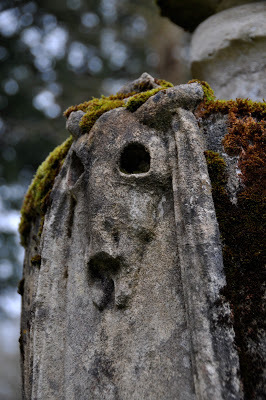 This cemetery is still in use. At Dunham Massey the dead dogs are not hidden away in the woods but lie under stone slabs in the middle of one of the main lawns near the house. 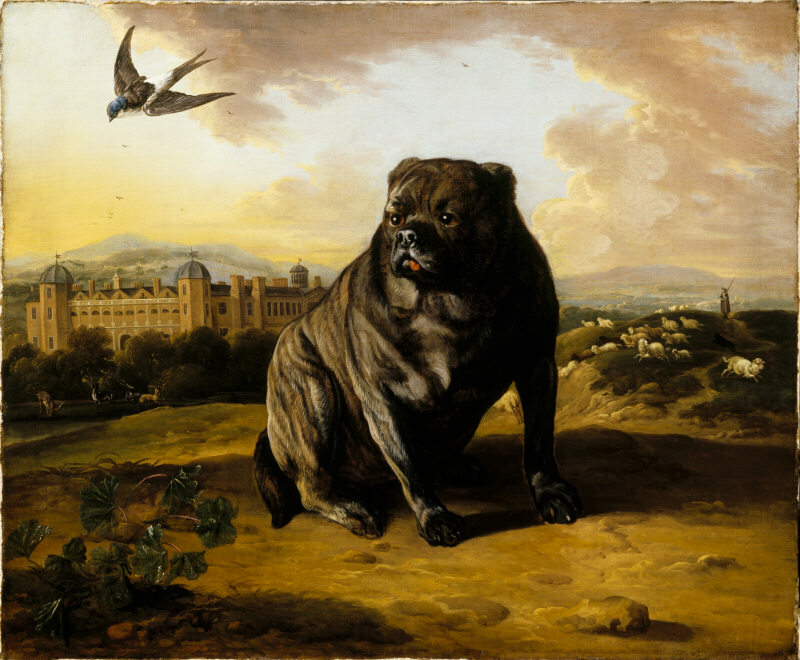 There too, Jan Wyck was diverted from painting his views of the house and estate to painting the Earl of Warrington’s Dutch mastiff, named Old Virtue. 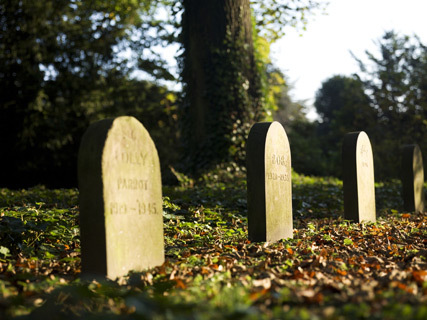 Unfortunately many dog cemeteries are not well recorded. 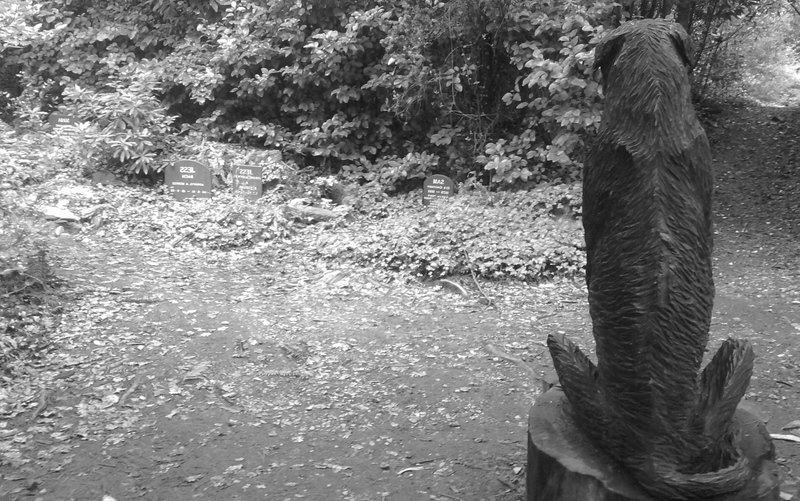 For example I’ve failed to find images of several that are mentioned on our database or elsewhere, even at quite significant estates such Linton Park, Ragley Hall, Woodlands Vale at Ryde, Plas Newton near Chester, and Wynards Park in County Durham. 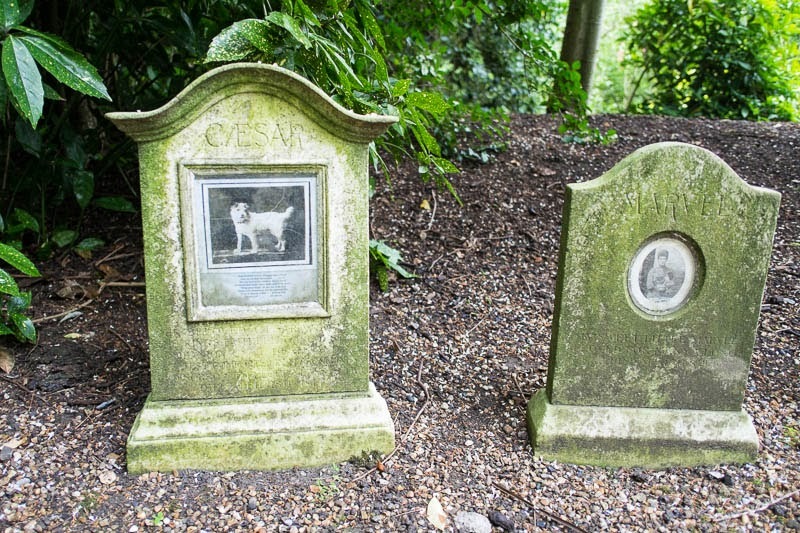 So, as always, if you have photographs of any of these, or know of any other dog cemeteries, let me know and I’ll try and follow them up in another post. But there are surprisingly quite a few with royal connections. Marlborough House gardens are home to the burial places of several of Queen Alexandra’s dogs, hidden away in the shrubbery in the bottom corner of the grounds. 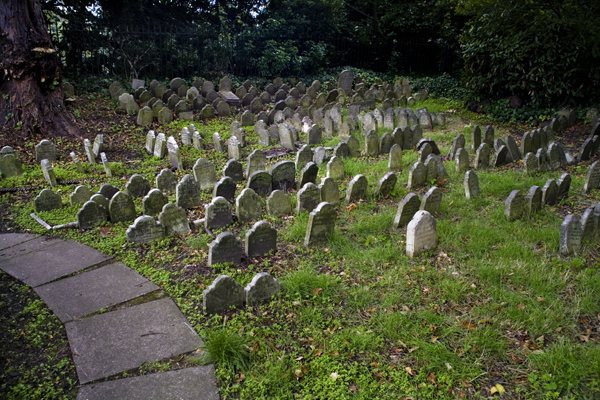 Hyde Park boasts a secret cemetery too, tucked away behind one of the lodges on the Bayswater Road near Lancaster Gate. 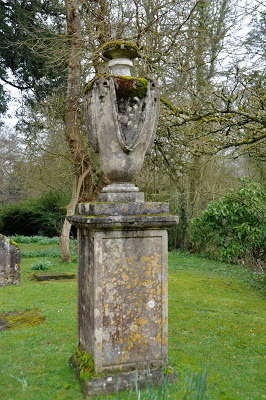 There is a fine 18thc memorial in the Somerset churchyard of St Mary Orchardleigh. 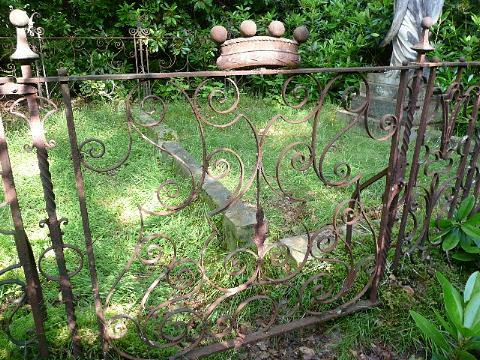 The story behind it is retold by Lucinda Lambton in Palaces for Pigs (pp222-225), and it inspired Sir Henry Newbolt’s poem Fidele’s Grassy Tomb in 1887. 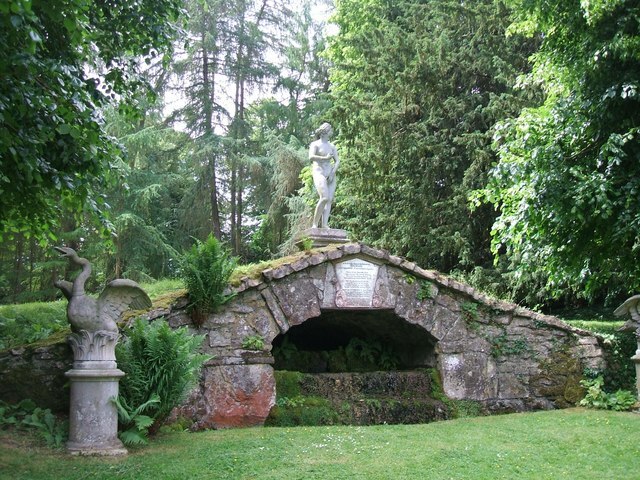 It is a monument for Azor, a German water pudelhund, given to Sir Thomas Champneys of Orchardleigh House. The dog is supposed to have saved his master from drowning and when he was dying Sir Thomas asked that the dog be buried with him. All was well until the Bishop of Bath and Wells heard about it, and furiously told the parson to get the animal moved out of consecrated ground. 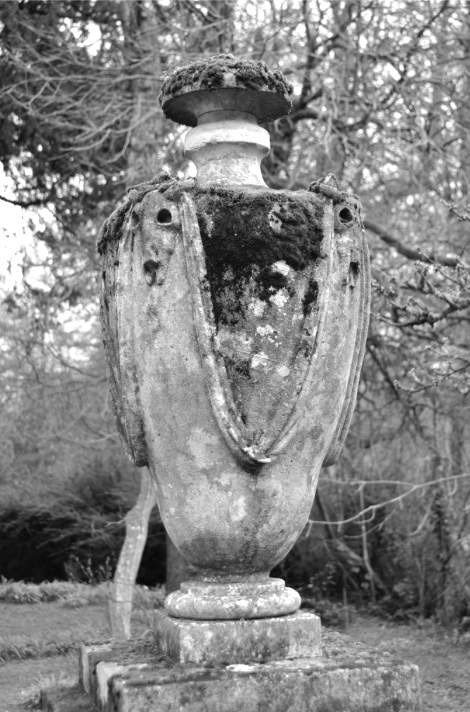 The dog was exhumed and reburied under the monumental urn in an adjacent field. Newbolt heard the story and wrote the poem when he was courting Margaret Duckworth, the daughter of the then squire of Orchardleigh. 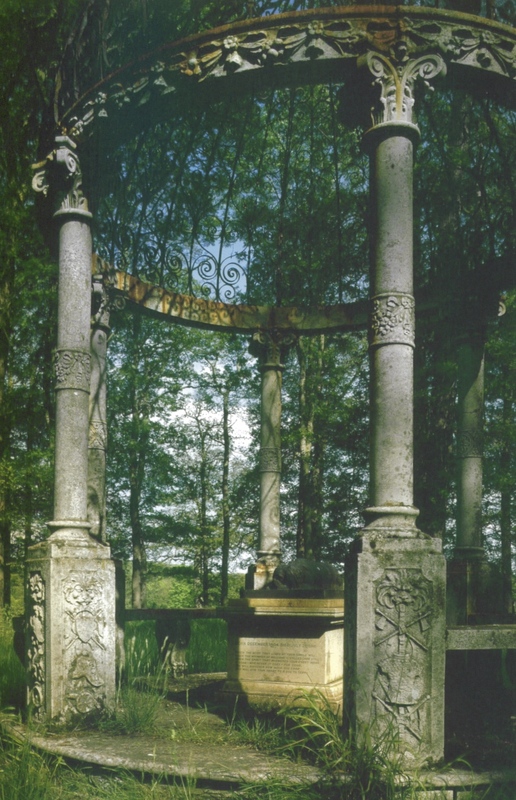 When the estate was sold in the 1980s the memorial was restored in memory of the last squire. Till it came at last to the Bishop’s ears. They must take the dog from his masters grave. And a Christian couldn’t ha’ done no more. 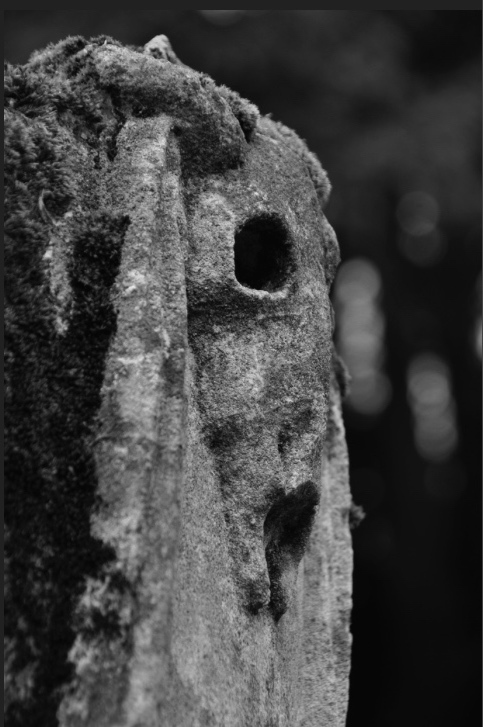 There rest Fidele’s bones as well. But. he knew one thing that a Bishop did not. Well done if you have got this far! And your reward is knowing that the assumption that the bishop’s instructions had been carried out by the sexton, and the dog reburied outside the graveyard, is wrong. When restoration work was taking place in the church in 1980s the dogs skeleton was found still at Champney’s feet. The bishop had been disobeyed. In a typically British way the parish was granted a faculty to leave him there and to move the monument back into the churchyard. 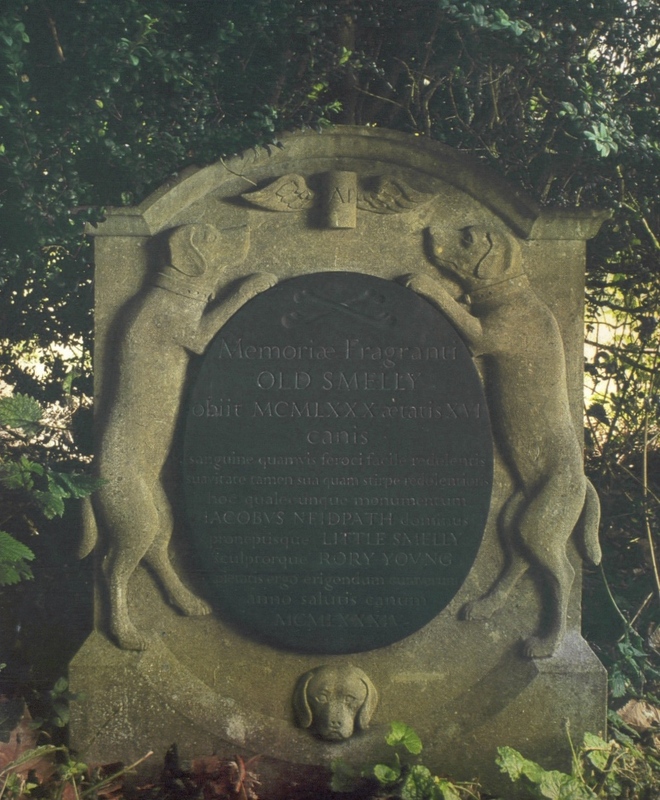 Have you noticed that I’ve got almost to the end of the post and I haven’t mentioned the most famous dog’s tomb of all? It will have to wait until another day because I’m going to finish with a modern memorial that I found in Lucinda Lambton’s Palaces for Pigs. 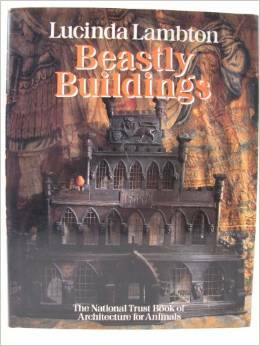 If you want to know more then Lucinda Lambton’s Palaces for Pigs (2011) and its predecessor, Beastly Buildings (1985)would be good places to start. 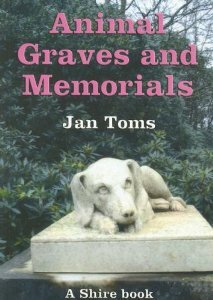 Otherwise check out Jan Toms’ book Animal Graves and Memorials (Shire 2006) which has a gazeteer of other sites. 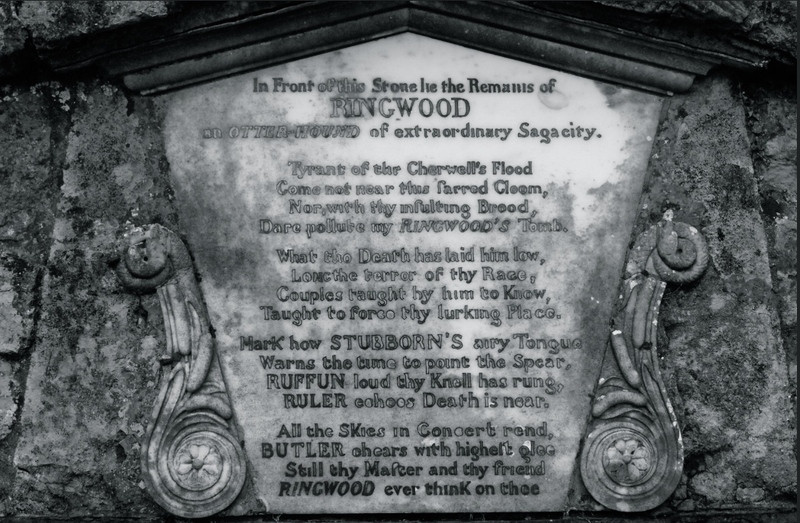 This entry was posted in Uncategorized and tagged burial, Byron, cemeteries, Dogs, Lucinda Lambton, Newstead Abbey, Rousham. Bookmark the permalink.